For the next few weeks our Traditional Tram Picture in Time series will be on the Isle of Man with photos taken during 1979 including some which have been withdrawn from service from a long-time. In this photo we see Trailer 55 all alone at Laxey Station in 1979. Presumably its motor is in the process of running round but it isn’t visible in this shot with the trailer standing on the northbound track so we come to the conclusion it has just terminated with a service from Derby Castle. 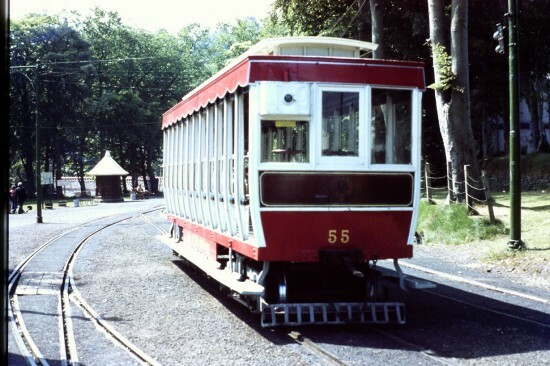 This open trailer was built in 1904 by the Electric Railway and Tramway Carriage Company and remained in service until storage in 1995 (including a short spell renumbered as 25 and finished in a special silver livery). A short spell of service in 1997 followed but after that it was firmly withdrawn from service and has spent spells stored at Laxey, Derby Castle and Ramsey Car Sheds. It is now in Derby Castle Bottom Shed stored on wooden blocks having been separated from its trucks in 2012. * Further archive photos from Bob Price can be found on Flickr. This entry was posted in Manx Electric Railway, Picture in Time. Bookmark the permalink.